The increasingly cold city is gradually illuminated with tiny pin-pricks of light, even in the darkest and heaviest corners, and most unknown alleyways. A warm glow spreads infectiously across the dour bricks and cobble-stones, leading the few knitted-scarf-clad people who brave the chill, into the buzzing centre of town, like an overly festive treasure-trail. It is like watching Christmas lights tactfully scattered over the buildings by some nimble elf, who knows the town like the back of his hand, stealing through the night to bring the freezing cultural hub back to life. 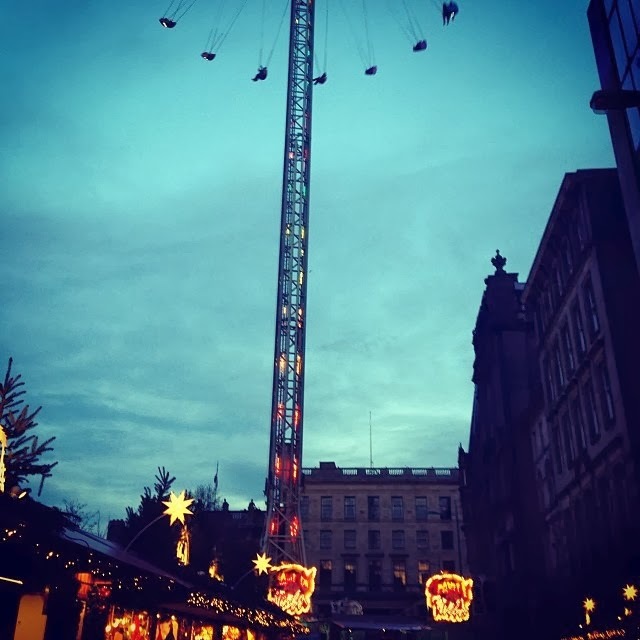 The centre of Edinburgh looks just beautiful right now with the yearly Christmas market, fun-fair rides and ice-skating rink. But mostly my life right now is filled with tea, Christmas television and reorganising my room for the new year. Re-discovering all my favourite cafes and bars, and finding new ones, as well as looking at what new art-house films are on at the Filmhouse, and what art exhibitions are on at the moment. This Christmas might be a little different for me this year (visiting relatives in Glasgow instead of staying at home), but it nevertheless feels so great to be back with family again. I can't guarantee them all - but I'm going to try!